Regina King, on bringing James Baldwin’s novel to the big screen in her Oscar-nominated performance in “If Beale Street Could Talk." Vanity Fair: "Regina King on the Wrenching Beale Street Scene That Didn’t Make the Film" — "After three almost-consecutive Emmy wins, Regina King knows how to handle the rigors of the TV awards season. The film space, though, is something else entirely. Shortly after 2018’s fall festival season, King was anointed an Oscar front-runner thanks to her stirring performance in 'If Beale Street Could Talk,' Barry Jenkins’s moving adaptation of James Baldwin’s 1974 novel. Her biggest test yet will come at the Golden Globes on Sunday, where she is nominated for both best supporting actress in a motion picture and best supporting actress in a limited series for her Emmy-winning performance in Netflix’s Seven Seconds. "Though she’s got three decades of film and television roles under her belt, the last few months have given King a crash course in the various critics-circle prizes and film festivals that line the path to the Oscars. The actress is finding ways to relish the novelty of it all—'It’s been crazy,' she said good-naturedly in a recent phone interview—even if the dizzying number of galas and ceremonies is wreaking havoc on her schedule. King has to balance pushing Beale Street with work on the Atlanta set of HBO’s Watchmen adaptation, a high-profile production that she is guarding every last detail with Game of Thrones–level secrecy. It’s her first foray into the superhero world, and her second collaboration with show creator Damon Lindelof, whom King also worked with on the drama series The Leftovers. "'I don’t think anyone’s ever seen me play someone like this,' she said carefully, describing her character. 'And in true Regina King fashion, yes, she is strong. I do not have any desire to play women that are not strong.' "
Variety: "Regina King on Breaking Down Racial Barriers: ‘It’s Not a Black Story, It’s an American Story’" — "Regina King made her Hollywood debut at 13 (in NBC’s '227'), and hasn’t stopped working since. That’s given her a front-row seat to seismic changes in the industry for women and people of color, and this past year has been no exception. "That unexpected may even include a comedy, she reveals — the next project that’s on her docket as a producer/director. Along with her sister, Reina, who’s also her producing partner, she’s found a writer with a 'unique' voice. 'It’s so hard in this day and age to do something that’s never been done,' she says, 'so the best we can do is look for content that is interesting for us.' 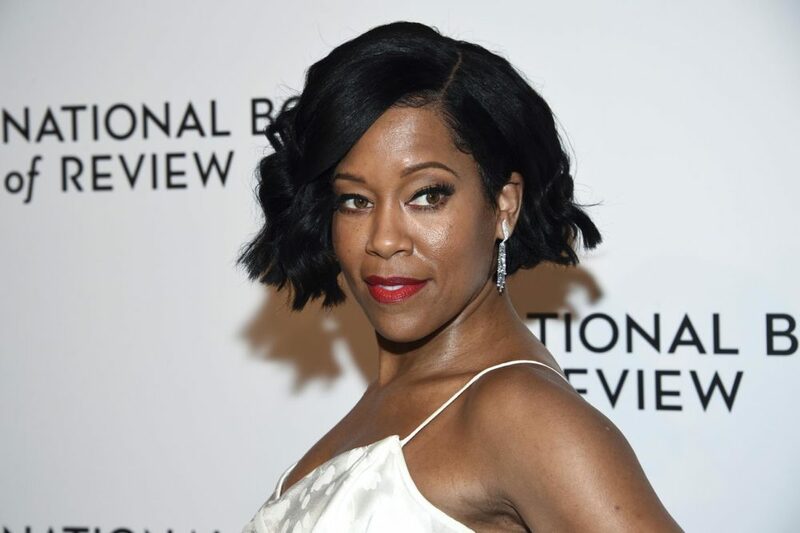 "
USA Today: "Oscar nominee Regina King: My commitment to gender equality must only be the beginning" — "We all have the power as individuals to turn our complaints into action and our concerns into change. That’s the message of the Time’s Up campaign, and that’s why I made a commitment during the Golden Globes to ensure that, within two years, women make up 50 percent of the crew for projects I produce. "We can't say there isn't a market for women in film. Women continue to make up the majority of moviegoers: According to the Motion Picture Association of America’s recent findings, women made up 52 percent of all 2016 moviegoers — an increase from 2015’s 51 percent. That’s right, women (51 percent of the population) continue to outnumber men at movie theaters, which makes the gender disparity onscreen and behind the scenes even more frustrating. "I know how difficult fulfilling this commitment is going to be, especially when women are constantly hearing that they aren't being hired for male-dominated positions because of lack of experience. We will have to push through the objections of studio executives who might turn down a woman by constantly reminding them that every person who has had success and every person who has a lengthy résumé had to have their first shot. We have to give more first shots."